If you’re planning or managing a construction project, there is a seemingly endless list of tasks to complete across many different phases of construction. You need to schedule and track work for your own team, as well as for your subcontractor teams and general contractor. Creating a construction timeline can help you track and manage all this important information in one place. This collection of free construction timeline templates can help you schedule any commercial or residential project more effectively. Find the one that works best for your project, client, and stakeholders, download it, and customize it to fit your needs. A construction project timeline is used to visualize schedules for either commercial or residential building projects. Timelines break down the work that needs to be done over various stages of the project life cycle, and are useful to gauge progress at a glance. A timeline is often represented as a spreadsheet or table, and may incorporate a Gantt chart (a bar chart that depicts work completed over time) for even more clarity. Because of their visual nature, construction timelines that include Gantt charts are especially useful for presentations or meetings with executives, team leaders, and other key stakeholders. They offer a clear snapshot of current versus expected work completed at important dates or milestones of the project, or at a specific phase. Sometimes, general contractors or construction project managers will create a different construction timeline for each group of subcontractors. This allows each team to track their work in more precise detail. Project Size and Difficulty: Obviously, a small, single-family home will take less time to construct than a sprawling, mixed-use commercial complex. The degree of difficulty is also a major factor. A custom-built home with many elaborate finishes, such as detailed trim and molding, custom cabinetry, and imported countertops and flooring will take much longer to complete than a tract home with stock appliances and standard finishes. Likewise, a commercial office building with complex wiring for security systems and computer networks will probably be more time-intensive than a basic storefront space. Weather/Season: Weather is one of the biggest contributors to new construction project delays. This is particularly true before the roof and walls are built, since the interior framing structure is exposed to the elements. Even light weather conditions and pose delays, since roofing materials need dry conditions for installation. What’s more, when there is a natural disaster or extreme inclement weather, construction crews may be spread thin with cleanup or restoration work, which limits their availability for your project. When creating your timeline, carefully consider the time of year. If exterior work, such as the foundation or framing, will fall during a particularly rainy, hot, or cold season, you may want to adjust your schedule so that interior work will fall during this time frame, instead. Crew and Material Availability: Another major factor in construction timeline delays is the availability of crew and materials. A subcontractor crew typically can’t begin work until the previous crew finishes — so one delay can have a domino effect that impacts the entire project’s completion. When scheduling, be realistic about how long it will take crews to complete their work, and communicate regularly with your general contractor. Crew size will impact how quickly work gets completed, as well. Be aware of the materials your project requires, and how they could impact your timeline. Materials that aren’t kept on hand locally, such as custom or imported fixtures, countertops, or flooring will have a longer lead time than basic, stock materials. Certain finishings also take longer to install than others — for example, installing an asphalt roof can be quicker than a tile one. Another important consideration: material suppliers frequently update their product catalogs, and phase out old products to make room for new ones. Verify the right materials will be available when you need them. Approvals, Permits, and Inspections: Construction projects need to be inspected at various stages, and approved by city and/or county building departments. Failed inspections or backlogs in issuing permits commonly cause delays. Plan these inspections at the right time, so the whole project won’t stall while waiting for approval. Of course, you or your contractor will also need to ensure the work corresponds with the plans and drawings. To ensure the structure is up to code, the inspector can either ask for more information or put a stop on the work altogether. Scope, Schedule, or Plan Changes: Any time a client, inspector, or subcontractor requests a change, delays are likely to occur. Depending on the nature and degree of the change, you may need to draw up new plans or obtain permits and inspections, which can result in schedule changes that threaten later stages of the project’s development. Try to work out as many details as possible ahead of time to prevent delaying overall project completion. Custom Build vs. Pre-Fab Construction: Deciding whether to do a custom build or use a pre-designed plan is especially common in residential construction. Custom design and build projects allow the client to choose the materials, appliances, fixtures, and finishings so they’re just the way they want them; however, this is a more time- and money-intensive undertaking. You may need to bring in special subcontractors, and ordering custom materials can have a long lead time. “Pre-fab” or tract homes are generally a quicker and more affordable option. Generally, crews for these projects are available on demand, and know exactly what their job will entail. These projects use stock materials that are readily available, and the project often comes at a fixed price. Pre-fab homes are especially common in large housing developments, where crews move from one build to another quickly. Communicates Expectations to Team Members: All of your team members and subcontractors know who needs to perform which tasks at what time. This keeps everyone on schedule, avoids confusion, and prevents delays caused by incorrect work. Creates an Action Plan: A timeline allows you to schedule work at the project, phase, and task levels. It helps you to determine which crews you need when, order the right materials at the right time, gauge progress, and communicate all of this to your team. Your general contractor can also use it as a guide when working with subcontractors. Helps Control Costs: A timeline helps you schedule work in the most efficient way possible, so one crew is finished in plenty of time for the next one to start. You can also schedule material delivery so that crews are never left waiting. Finally, you can use your timeline to come up with contingency plans for times where construction will interfere with business operations or with residents. Facilitates Communication with Contractor: No matter how well you plan, your project may still require changes. Your timeline can help you gauge the impact those changes will have on other tasks, phases, and subcontractor work. It also allows you to collaborate with your general contractor on schedule and budget adjustments to minimize the negative impact of changes. Establishes a Work Hierarchy: Create a more precise schedule by establishing a hierarchy of project phases, tasks, and subtasks. You can include a Gantt chart as part of your timeline to more clearly visualize task relationships and dependencies, and to gauge the effect of any changes or delays. Pre-Construction: Secure permits and prepare contracts and specifications, and get the lot cleared and ready for construction. This can take anywhere from several weeks to several months, depending on the permitting process. Weeks 1-3: Pour the footers and foundation. A foundation inspection is conducted to make sure it’s the right material and thickness, and that the necessary vents and waterproofing are being used. Weeks 4-5: Frame the floors, walls, and roof. If the building is more than one storey, frame all levels simultaneously. Sheathe and shingle the roof. Framing inspections are conducted to verify safety and quality. After the inspector approves the work, install exterior finishes to protect the interior. Weeks 6-8: Install electrical, plumbing, insulation, drywall, and HVAC systems. Inspections are done to ensure electrical and mechanical systems are compliant. Once these systems are approved, put up the insulation and drywall. Weeks 9-11: Complete the flooring, doors, cabinets, paint, trim and molding, and other interior finishes. Weeks 12-14: Install the fixtures, appliances, countertops, outlets, and switch covers. Complete the final plumbing and electrical work. Landscaping, design, and any remaining exterior work is done. Turn on electrical and HVAC systems. The final building code inspection is conducted; if any issues are found, they must be fixed before the house can be approved. Once approved, the formal closeout is performed. Timelines for commercial and residential construction projects involve many of the same steps and processes. However, there are a few differences. Commercial construction projects often take longer to complete, since they are larger-scale. They may also have more complex interior work, such as wiring for security systems and computer networks, as well as HVAC and plumbing systems that need to service multiple floors. The process of obtaining permits also tends to be longer with commercial construction projects. There are city and county regulations, zoning laws, and environmental considerations. Getting the necessary permits and inspections can take anywhere from several weeks to several months, so be sure to build this into your timeline. Finally, there may be more — and more specialized — crews of subcontractors involved with commercial building projects. Carefully schedule the work for these crews to ensure their work doesn’t overlap and that they are available during the proper phase of construction. Set a Realistic Schedule: Allow enough time for each phase of your construction project. Rushing work because of an unrealistic deadline will ultimately create more headaches: you can make mistakes that are time- and cost-intensive to repair, or skip important steps that cause serious problems — and even failed inspections — down the road. Plan Around the Weather: As mentioned, storms and inclement weather can temporarily or permanently delay a construction project. Try to schedule exterior construction during a dry, moderate season. Extreme heat, cold, or standing water can negatively impact your project. Include Necessary Details: Crews must be able to discern exactly what they’re doing from the timeline, and when. They need to understand their tasks and the logical order of work. Before beginning construction, make a schedule that outlines all of the tasks and phases from start to finish. Have the client, architect, contractors, consultants, and any other major stakeholders review the timeline in advance and make any necessary corrections. Plan for the Final Phase: A common mistake in construction work is not scheduling enough time for the final details. Late-stage work such as custom trim and molding can take longer than project managers initially realize, and may involve multiple crews of subcontractors to complete. Balance Wants and Needs: Time is one of the biggest contributors to cost overruns. When creating your timeline, balance needs and wants. If there is anything you’re planning to build that’s not completely necessary to successfully completing your project, you may want to eliminate it or find a more expedient alternative. Collaborate With Your Team: Whether you use pen and paper, spreadsheets, bar charts, or project management software, make sure your team is all on the same page about how to track and communicate project progress. Share the timeline you create with your team in your preferred medium, and create a standard for making changes. Bring Contractors on Board Early: Choosing a general contractor early on can help you achieve key goals and milestones on schedule. The contractor can review your timeline and make sure it’s realistic for the developer, subcontractors, and any businesses or tenants involved. Create a Project Plan and Budget First: By establishing a project plan and budget before creating your timeline, you can verify that deliverables and milestones are accurate and feasible. Since time is a huge factor in project cost, knowing the budget can also help you schedule accordingly. If you’re planning a commercial construction project, this template can help you stay on track. It’s divided into separate sections for each phase of construction, so you can ensure important tasks are scheduled at every step along the way, from proposal and documentation to final closeout. Keep clients, stakeholders, and contractors in the loop with this comprehensive template. When creating a timeline for residential construction, you must ensure you’ll complete the home on time for the owners to move in. This house construction timeline can help keep your project on schedule. You can also plan when each draw will occur to better manage your budget. Track the start and end dates, as well as the expected duration of each task in the project. Then use the built-in Gantt chart functionality to visualize your project from start to finish. It’s especially important to complete commercial renovations on time, since business operations may be put on hold during construction. If you’re expanding or remodeling an office building, use this versatile timeline template. Track the start and finish dates of stages as well as individual tasks, and use the Gantt chart to see how the renovation is progressing over time. Whether it’s a kitchen remodel, a bathroom upgrade, or an entire house remodel, this home construction timeline template will help you keep track of all the details. Schedule the start and end date for every stage of construction, from demolition to closeout, and clearly visualize the whole project. Building a school can be a complex undertaking. Construction timelines help ensure all tasks are completed, from classrooms to lunchrooms. Determine how long it will take to construct each part of the school, and track work for multiple subcontractors all in one place. Smartsheet is a work management and automation platform that enables enterprises and teams to work better. Many of the world’s largest construction companies rely on Smartsheet to stay productive, communicate among far-flung teams, and document every step of the project. 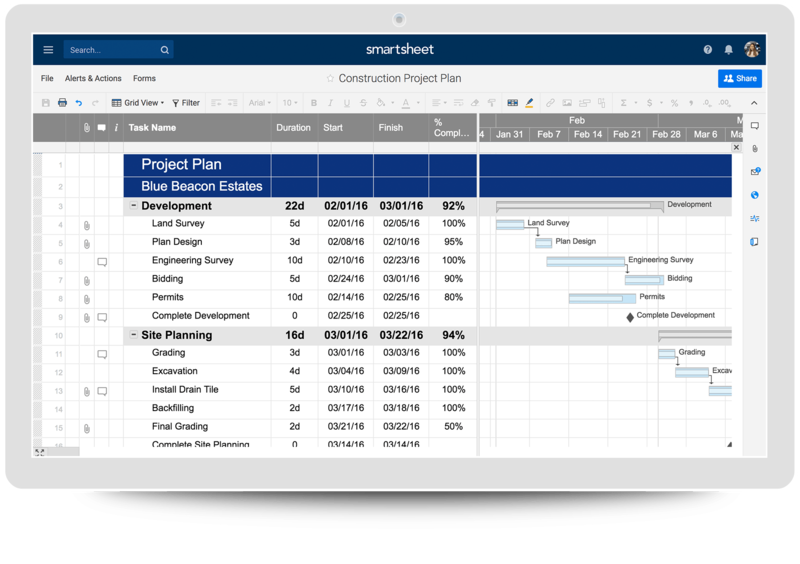 In addition to pre-built construction templates, Smartsheet can improve your organization, planning, and document management in your next construction project. With automatic Gantt charts and critical path, intuitive file attachments, and alerts and reminders, you can build a central repository and share your timeline with team members so anyone can access project details in real time. Once construction is underway, use Smartsheet’s self-service reports and dashboards to get real-time visibility into resources, status, and performance so you can rapidly align operations to strategy.